What does Google Instant Previews Mean for Search Marketers? A couple of weeks ago, Google launched Google Instant Previews for organic search results. What this means is that searchers can now preview your landing page within the Search Engine Results Page (by clicking on a magnifying glass next to your natural result), prior to actually clicking through to your site. First and foremost, Google Instant Previews makes it even more important to match and optimize your keywords to your prefered landing page. The page preview now tries to address searcher expectations up front, so it’s important to make sure that the landing page presented is the most relevent for the searcher’s query. 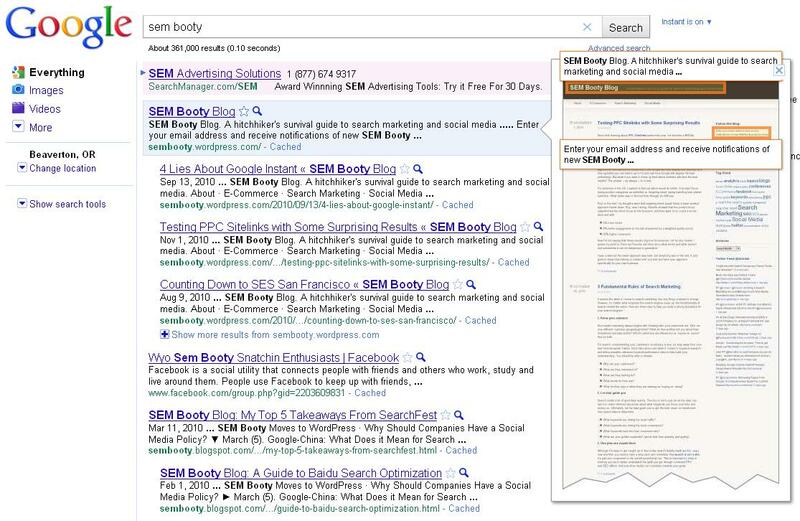 Have you checked what your preview pages look like in the SERP for your top keywords? If not, then you should as you don’t know what you don’t know. Do your pages preview fully? How do your pages look and scale? A word of warning: If your page is built entirely in Flash (or has Flash components) then they will not appear within Google Instant Preview. Some videos are also appearing as black squares. Camp Google say they’re on the case, but as of this moment, your preview might be looking like an empty page… or a black hole, which could harm your click-throughs. As you would expect, the page body copy that appears within Google Instant Previews is too small to read, even for those lucky people with 20/20 vision. So sometimes, you’ll see a call-out box appear on the preview which enlarges a section of copy that Google deems to be the most relevent area on the page (as you can see in the highlighted boxes in the example above). I’m not exactly sure how Google determines which area to highlight, but it seems to be a sentence on the page which includes keywords that match exactly to the search query… at least from the tests that I’ve done. Saying that, there have been instances where no call-out was showing, even when the keywords on the page matched the query. So if anyone out there knows the answer, please enlighten us! Because text is so small, what catches your eye most in Google Instant Previews (other than the call-outs), are a main image and the page headline, so make sure these are relevant. However, try not to clutter up the page with too many images. Keep it clean and instantly relatable to your target keywords. This will help the preview pop a bit more and help to build that relevancy bridge.